Before beginning Taste Budd's Inc., in the Spring of 2000, Chef Dan Budd spent the previous 23 years creating pastries and desserts in some of the world's finest hotels and restaurants in America and France. A 1987 graduate of The Culinary Institute of America. Chef Budd has been the pastry chef at such famous eateries as New York Cities River Cafe and Adrienne and was the opening pastry chef of the highly acclaimed Park Avenue Cafe in both New York and Chicago. Both Chocolatier and Pastry Art and Design magazines have named Chef Budd on their lists of the "Ten best pastry chefs in America". Avenue magazine cited him as one of the "People who are changing the way America eats." This Vermont raised boy has also won the 1993 "Chartreuse Pastry Chef of the year" and been nominated as, "Pastry Chef of the Year" by the James Beard Foundation. He has appeared on The TV Food Network, Good Day New York and Good Morning America and attended The Valrhona Chocolate School in the Rhone valley of France. In 1998, Chef Budd was one of eight American pastry chefs who accepted an invitation to create centerpieces for President Clinton and the first Lady at the White House Easter egg hunt. His work has been published in several books and publications such as Art Culinaire, Fine Cooking, Bon Appetit, Chocolatier and Gourmet magazines. He has been a media spokesperson specializing in televised cooking demonstrations nationwide. Chef Budd has received awards and honors including a Gold Medal for a pastry display at the Societe Culinaire Philanthropique Culinary Salon in New York City. He participated in the 1996 Cuisines of the Sun in Hawaii, and the 1998 American Food Festival in Atsugi, Japan. 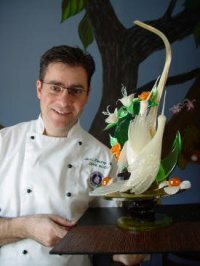 Chef Budd has been annual member of the jury for the United States Pastry Competition and received their “Life Time Achievement" award in 2005. Chef Budd spent 5-1/2 years sharing his knowledge with others as a full time Associate Professor in Baking and Pastry Arts at The Culinary Institute of America, our nation’s most prestigious culinary and pastry arts college. Mary was raised in Saugerties and graduated in 1999 with a degree in Psychology/Criminology from the College of Saint Rose in Albany. She originally wanted to work in forensics but chose not to go the police route and instead continued to work for the Gap, where she eventually became an assistant manager and was so for 7 years. Mary quit in 2006 and decided to go to the Culinary Institute of America, because she was interested in Baking and Pastry. Mary was Taste Budd's first Extern and graduated with perfect attendance in February of 2009. Chris graduated in January of 2014 from the Culinary Institute of America with his associate degree in baking and pastry. During his schooling he externed at Taste Budd’s, where he realized his passion for creating new desserts and confections. After graduating from the CIA he was hired at Taste Budd’s as the pastry sous chef doing research and development. Chris is determined of one day owning his one bakery and patisserie focusing on bread and French/Italian desserts and confections. Alicia graduated from Red Hook High School in 2013. She never really had an appreciation for her town until she started working at Taste Budd’s. Taste Budd’s has brought her closer to the community than she ever thought possible. Alicia never really knew what she wanted to do as a career and Taste Budd’s has helped her in that journey. Being the assistant manager, she has been given tasks such as creating and maintaining social media accounts, designing new menus, and creating promotions for the company. It has introduced her to a new love she has for Web Design and Development. She is currently enrolled at SUNY Ulster getting a certificate in Computer Science and working toward an Associates Degree in Web Development, hoping to earn a Master’s Degree throughout her career. Graduated with a masters degree in applied mathematics from The University of Delaware. Became a computer programmer for IBM corporation. Retired early from IBM to become a stay at home Mom. Raising 4 children(Kevin, Danielle, Kristin and Tommy) Terri decided it would be fun to work with them at Taste Budd's for The Dutchess County Fair in Aug. 2005. She has stayed with Taste Budd's part time ever since. Terri loves to read, snowboard, soccer, running, biking and most of all being with her family. Dan Budd's sister Tricia decided to be a bookkeeper in 8th grade, she studied accounting in high school and college. She graduated from Champlain College in Burlington, Vermont in 1986. Tricia has been employed as a bookkeeper in many sectors of business - health club management, property management, retail, wholesale, construction, & manufacturing. Tricia met her husband Philip Scott in Vermont as he was beginning his career with Kodak. His job has taken them to Boston, Massachusetts; Atlanta, Georgia; Columbus, Ohio; and currently Rochester, NY. She has 3 kids, Marissa, Cameron, and Anna. Tricia currently works remotely for Taste Budd's. She oversees Taste Budd's book keeping. She loves to ski, hike, camp, kayak and travel. Kathleen graduated from the School of Management at SUNY Binghamton with a BS in Management. She had a 12 year career at Citigroup in Manhattan where she worked in several different areas of the Bank, including Global Relationship Banking and Private Banking. Kathleen then decided to stay at home to raise her three sons (Aidan, Kieran and Brody). She is currently working part time from home for Taste Budd's. Dan's parents have been supporting Taste Budd's since the first day. Believing in Dan's dream they are a very special part of this small business' success. Residing in Vermont Merritt operates a franchise of Winzer Corporation. Merritt is celebrating over 30 years of dedicated service to the industrial maintenance and automotive repair industries. Sometimes he is called the McGyver of Taste Budd's. A retired nursery school teacher Kathy has been nurturing young children for over 30 years. She currently has a regular schedule of story time readings for children in the Rutland area of Vermont. Many people have supported Taste Budd's over the years. Lending a hand, offering ideas, spreading the word!! In many ways these people have helped contribute to our success. We are grateful for their guidance.